Sydney is about as polytheistic a place as graces the globe, and in our pantheon, the Waterfront is one of the most modern of apotheoses. Seething crowds process down to worship at the temples of the beaches, and are directed to their pews and baptismal plunging places by self-righteous vergers in surf club red and yellow, their standards flapping the same yellow and red in the wind proclaiming a false ownership of the sand and sea beyond. This is not the love of the seashore, an experience of the interaction between sea and land, or of the sea in all its numinous mystery and power. It is most often just a vain playground experience dressed up in a shallow catechism. Were we heading for the living seashore and not a consecrated sandpit, it ought not be the case that for most of these beaches, a tractor appears at dawn to cart the ecological lifeblood of the beach away as rubbish – the washed up seaweed. Dominated by our most common kelp, Ecklonia radiata, this ought to gather in clumps teeming with sand hoppers (Amphipoda) and other invertebrates, pecked over by wading shorebirds feeding on them, and washing back into the water to feed fish, crabs and others with the release of its rich nutriment. And so to my point. If local councils are just chucking this stuff out with the rubbish from the soft sand (which really is a lot less in these anti-littering and smoke-free beach days), then I might as well beat them to the resource and make what I think is a better use of it: Fertiliser for my vegie patch and community garden aquaponics setup. Strangely enough, it is actually illegal because (as I understand it) we have state law intended to protect beach-cast seaweed because it has an ecological purpose. But with Councils seemingly exempted and nullifying the purpose, I share a friendly wave with the Council tractor driver as I fill my two buckets either ahead of him or in the places he can’t reach. One bucket will be spread over the withered winter die-off on my asparagus bed. It will dry in the sun and swell up again as a wonderful moisture regulating mulch, slowly breaking down in time to feed the Spring shooting of new spears. I used to rinse it in fear of the salt, but gave up when I heard figures from a geomorphologist (numbers for which I now forget) on wind-borne salt loads that pass through Sydney coastal soils naturally (I garden on coastal sand that doesn’t just leach easily of salt, but nutrients too). I will do the same between rows of newly planted vegies – again, for nutrients and moisture retaining mulch. A couple of times a year a bucketful goes into a bin full of water to make seaweed tea as a communal community garden resource. And I will load it into my worm farm – an utter revelation for me. We hear of the wonders of worm juice and we hear of the wonders of seaweed tea / liquid kelp fertiliser. The stuff that I am getting is then two (or three) for one on wonders. 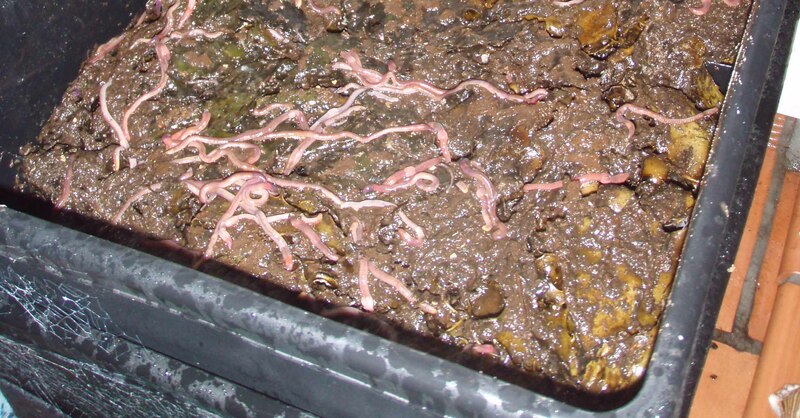 The worms have so far handled it just fine if they are not swamped under it. It seems, on limited evidence and intuition, that they are best being able to work down or up into the kelp from less slimy (more ‘usual’) kinds of compost and scraps (I keep meaning to add comfrey to the mix but haven’t got there yet). Compost: Layering layers upon layers of layers; now there is a catechism that makes sense. 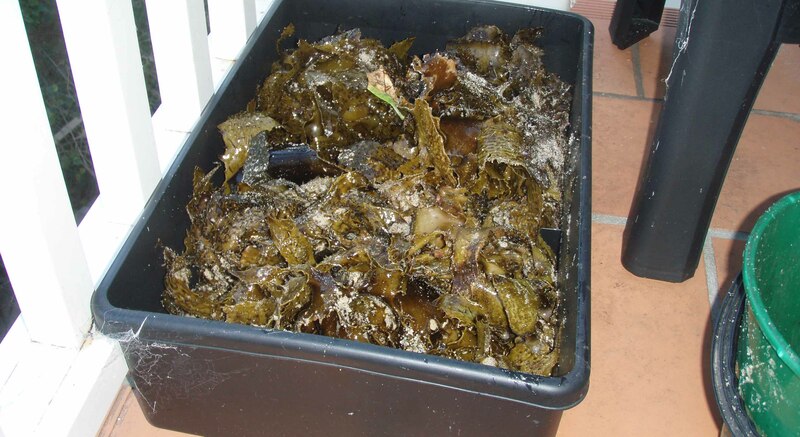 Frequent watering of the worm farm and use of the drained worm/kelp tea also seems a good idea because a) it seems worth diluting and b) the issue of the potentially damaging salt levels ought perhaps not be completely ignored. Along with other compost and the dung and urine rich stable straw that our community garden gets from the Police stables, kelp has become the thing that makes coastal sand seemingly as good for growing vegies as any soil. Hand gathered, no fossil-fuel use, organic, otherwise destined to be rubbish, it scores unbeatably for ethical garden inputs as well – just as long as it comes from a groomed beach. Postscript: I have since learned that it is legal to collect up to 20kg per day on most NSW beaches.